They may be free, but they sure pay. 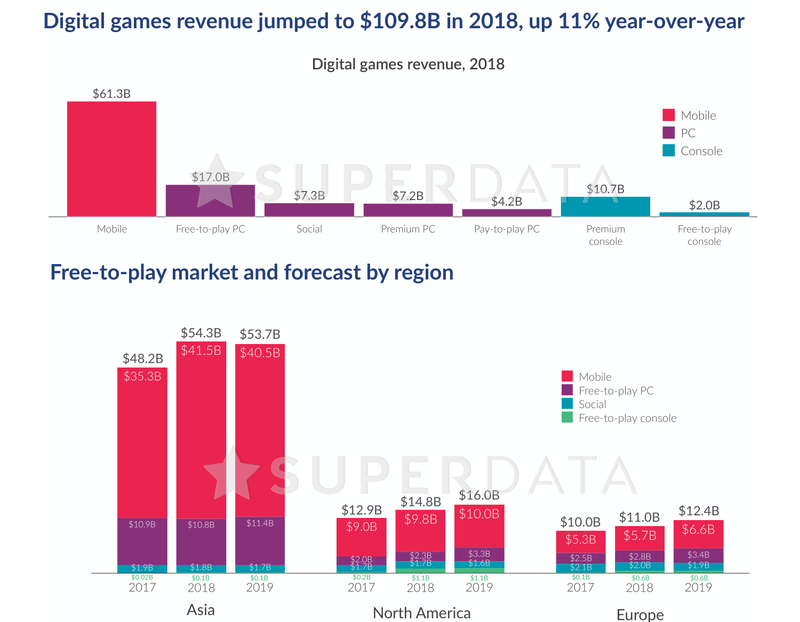 Games with no upfront cost but a plethora of other ways to make money generated a mind-blowing $88 billion in 2018 according to SuperData’s year-end report — leaving traditional games (and indeed movies and TV) in the dust. While it may not come as a surprise that F2P (as free to play is often abbreviated) is big business at the end of 2018, the Year of Fortnite, the sheer size of it can hardly fail to impress. The total gaming market, as this report measures it, amounts to a staggering $110 billion, of which more than half (about $61 billion) came from mobile, which is of course the natural home of the F2P platform. The $88 billion in F2P revenue across all platforms is large enough to produce a dynamite top 10 and an enormously long tail. Fortnite, with its huge following and multi-platform chops, was far and away the top earner with $2.4 billion in revenue; after that is a jumble of PC, mobile, Asian and Western games of a variety of styles. The top 10 together brought in a total of $14.6 billion — leaving a king’s ransom for thousands of other titles to divide. “Traditional” gaming, a term that is rapidly losing meaning and relevance, but which we can take to mean a game that you can pay perhaps $60 for and then play without significant further investment, amounted to about $16 billion across PCs and consoles worldwide. An exception is the immensely popular PlayerUnknown’s Battlegrounds, one of the hits that touched off the “battle royale” craze, which took in a billion on its own — though how much of that is sales versus microtransactions isn’t clear. Amazingly, Grand Theft Auto V, a game that came out five years ago, generated some $628 million last year (mostly from its online portion, no doubt). The top titles there are nearly all parts of a series, and all lean heavily toward the Western and console-based, with only pennies (comparatively) going to Asian markets. China is a whole different world when it comes to gaming and distribution, so this isn’t too surprising. Lastly, it would be neglectful not to mention the explosion of viewership on YouTube and Twitch, which together formed half of all gaming video revenue, with Twitch ahead by a considerable margin. But the real winner is Ninja, by far the most-watched streamer on Twitch with an astonishing 218 million hours watched by fans. Congratulations to him and the others making a living in this strange and fabulous new market.